Traveling around the Amalfi Coast can be somewhat of a challenge for those who are short on either time or money. When planning for our Amalfi Coast trip, I weighed the pros and cons of each coastal city, ultimately deciding on Amalfi. Here are the details of how we got around fairly inexpensively and comfortably. 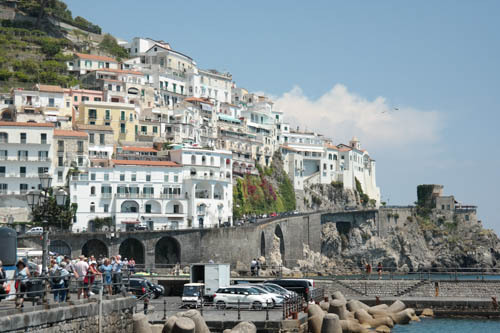 My Favorite Amalfi Coast Town: Amalfi has many things going for it. It is easy to reach or leave by boat. Its hotels are easy to reach from public transportation drop-off points (this was important to us since we didn’t want to lug luggage up and down cliff-side stairs). It has a nice beach that is close to the city center. It’s centrally located with other Amalfi Coast cities within an easy walk (Atrani), hike (Ravello), bus, or ferry ride. Amalfi has lots of restaurant options and I found the hotels there to be a good value. Should I Leave from Naples or Salerno? The Amalfi Coast can be easily reached from Naples or Salerno, but if you are staying in Amalfi you will want to arrive in Salerno which is closer to Amalfi. An Italo train from Rome to Salerno takes two hours making Rome to Amalfi within reach. Given the fact that one will still have to transfer from Salerno to their Amalfi Coast location, I wouldn’t recommend this as a day trip though. The Salerno train station is easily accessible to Amalfi Coast public transportation. It is a ten-minute walk from the ferry port. There is a bus station right outside the train station doors. 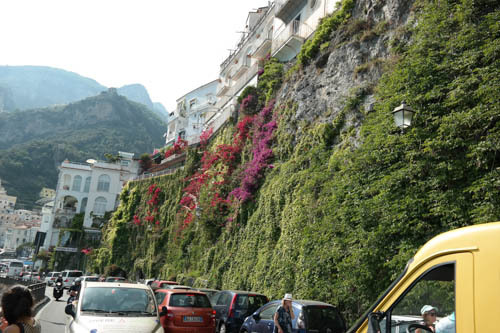 One of the reasons to pick Amalfi as your home base is because of how easily accessible it is. Amalfi Coast cities are quite vertical. Some, like Positano, have hotels and shops that start further up the mountainside whereas Amalfi is located right on the water so ferries, buses, and taxis all meet at the base of the city. This means that most hotels are within a five-ten minute walk from public transportation. Our train arrived a little too late for us to catch the last ferry of the day. Although we could have easily taken a bus, we didn’t want a crowded hour and fifteen-minute bus ride to be our first introduction to the Amalfi Coast. Plus, we had a lot of luggage. On the flip side, I didn’t want to pay the 100-150€ price tag that were quoted for transfer from the Salerno train station to Amalfi. Naples is even further, so that was not a saving at all. I contacted our hotel and they arranged for a private taxi to pick us up and deliver us to Amalfi for 55€. I felt this was an incredibly reasonable price for the hour-long drive. Having a private driver meant the thrill of having someone holding a sign with our last name on it. Our driver was quite fluent in English and gave us a nice tour pointing out each town along the drive and sharing little tidbits about them. Taking a private taxi ride was a spectacular way to see the breathtaking views of the coastal drive. I would highly recommend asking your hotel if they can arrange transport for you. I’ve found that even small Italian hotels will perform the type of concierge services we expect only from five-star hotels in the States. Our place, although very nice, was modestly-priced at around 130€ per night. On the way back to the train station, we took the ferry. It cost 8€ per person and took 45 minutes. We had plenty of room for our luggage and tons of space for ourselves. The walk to the train station from the dock took about ten minutes. Atrani is a ten-fifteen minute walk from Amalfi along the Amalfi Coast highway. This easy walk provides plenty of gorgeous scenery. When traveling from Amalfi to Ravello you can hike or take a bus. There are two types of buses: the more expensive open-top buses or the relatively cheap public transit Sita bus. Buy your tickets for the Sita bus at a tabacchi (there is one across from the bus stop in Amalfi) or at a tourist station. When you queue up for the line, get as close to the front as possible. These buses get packed fast, so you will want to move quickly once the doors are open. It’s about a 25-minute ride to Ravello with stops along the way. At one point, you will get the thrill of backing up on a cliff! The buses get hot and crowded, so if you are claustrophobic you may want to pay more for the open-top one or hike up. If hiking, there are signs leading up the mountain, but I didn’t think the path was very well-marked. I recommend taking a ferry from Amalfi to Positano. The ferries, although more expensive than the public buses, provide jaw-dropping views of the coast. They take about 20 minutes and cost 8€ one way. You can buy tickets at the tourist center right near the dock. There are also kiosks on the walkway to the boats. When we went to Positano, it was a hot day and I loved feeling the wind whipping through my hair. Seeing grand, sparking-white homes cut into the cliffside and the view of Positano from the water was incredibly picturesque. On the way back to Amalfi, you may want to take the Sita bus for a cheaper option. On the way back, your bus will hug the railing towards the water so the views will be great. Sit on the bus’s right-side for the best views. But beware that a lot of people want those cheap seats, too. Also, since so many people stay in Sorrento or Positano and are traveling to Amalfi/Ravello, you may just decide to take the ferry back. It is easy to reach Sorrento, Capri, Ischia, or Salerno from Amalfi by ferry. By bus, you can easily reach the smaller cities along the coastline, such as Praiano, Maiori, and Minori. I advise not trying to move back and forth from Naples to Amalfi via bus or boat. Use a train to get to Salerno and then go via ferry, bus, or private car from there. If you do wish to get to Naples from Amalfi by ferry, you will need to switch over in Sorrento. The trip via bus is quite long, but can be done also. Amalfi is a centrally-located city along the Amalfi Coast with interesting historical sites to see (their Duomo, ancient paper mills, maritime museum), good hotels to stay at, and tasty restaurants to try. As with the other Amalfi Coast cities, there is plenty of limoncello to sip on and lots of ceramics and sandals to buy. 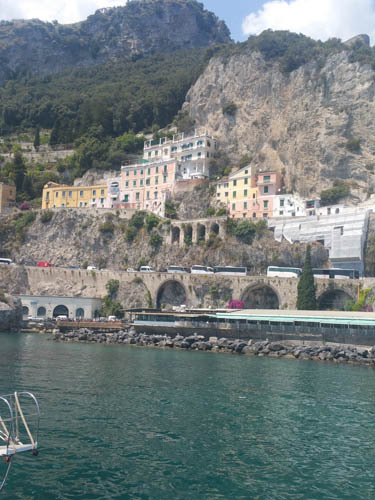 For the value, ease of access, and historical sites, I recommend Amalfi. Going to Italy? Roaming Historian readers can save money on The Roman Guy tours in many Italian cities! Just use the Roman Guy promo code “ROAMING” when booking to get 5% off of most small-group tours. Buon viaggio!